The weather cleared during the night, and being at over 500m altitude it got a bit chilly. The following morning was bright and quickly warmed up; a nice change from the damp that had been with us the prior day. Contrary to what some people like, I don't mind cycling in the wet but for a day of hiking and boating and sightseeing I much prefer to be dry. We got a little caught out by the camping attendant's description of how to get to the dock to start our trip: it was 2k walk to get to the carpark to start the 1.5k walk to the dock, not 2k total! Still, we had enough time and got the boat ok. The trip is well established, going out past the cerro torrecillas glacier, and then docking for about 2 hours at the north end of lago Menéndez while you take a guided hike across to lake Cisnes and back, taking in the wildlife and of course the showpiece 2600 year old "abeulo" (grandfather) alerce tree. The guide was knowledgeable and spoke good English so gave a good running translation for the gringo group! Emma enjoyed finding out about some of the plants we'd been seeing along the way. On the tour where a couple cyclists we'd met on the road the previous day, Ryan and Mackenzie (www.ryanaslett.com) from Portland USA. Also, we were surprised to see Jonathan, the Canadian guy who'd been on our rafting trip two days earlier, so we had a good few people to chat to about travel plans. On return from the trip we decided to cycle on for a bit to get nearer the north exit of the park. We wished we'd just cycled up to the carpark, to avoid the 2km hike back to the campsite just to cycle back to the same spot! From there we had a couple stiff climbs to make, as the road winds up through the lake system each one higher than the last. I tend to find cycling alongside lakes here tough work, as the roads often climb over the cliffs along the side rather than stay at water height. But unlike mountain climbs these hills are short and steep, and rarely reward you with anything other than the view you already had before each climb! However the road in this park took in quite beautiful views and wound through passes from one lake to the next. Around 9 we arrived at the free campsite at the northern park gate. Great facilities for a free site (especially compared to the high prices of the previous night) and we had a great location beside the lake, the sound of which was really relaxing and made sleep very easy! Next morning required two attempts to get going; after breakfast we were both very cold as being on the eastern side of the lake the sun was late making it over the mountain cover. So we took the chance for a snooze until the sun arrived! When it did, it quickly turned into a very hot day. As the road left the park it deteriorated in quality, soon we were back on the sort of ripio we'd feared we'd have spent the previous two days on. In the end it was only 40k of the bad stuff though. At the Cholila junction we stopped for lunch, popping into the shop for ice cream we got distracted by the cakes and had a few of those! Bargain prices let us know we'd left the park now. The r71 road north had more construction work (must be the month for it here as well as in Chile!) and once again this resulted in some extremely loose temporary surfaces. Along the way we stopped for a break and take photos at what I guessed was Butch Cassidy and the Sundance kid's Patagonian ranch. Whilst featured in both guide books it's not signposted so takes some guesswork. Thankfully the construction work finally gave way to newly paved road, which carried us the final 10km to rejoin our old friend we hadn't seen for weeks, ruta 40. We started our tour around mile-marker 200km on this road, here now we're on 1890km! 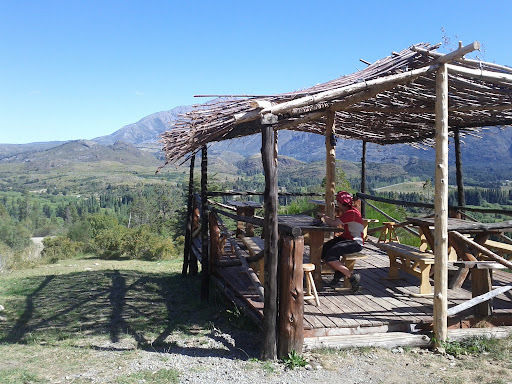 We skipped past the town of Epuyén, not fancying the drop down to climb back out, but carried on the main road's long descent and then on a small rise stopped at El Balcon cafe for cold drinks and more cakes and ice cream sat out on their balcony (photo. it's all there in the name!) with a smashing view back to the town and what I think is the Cordilla mountain range. This is the fruit growing capital of the region, and we smelt strong citrus aroma on some climbs, and saw numerous cars stopped by the road for blackberry picking! Stopped for the night another 15km down the road, near El Hoyo at a roadside campsite. With summer holiday season families all around, it seems a million miles from the remoteness of wild camping further south just a few weeks ago, but the improved facilities are certainly welcome, but they come at a price!